It is important to note that printing to the PP Image Printer creates a raster image (bitmap/graphic) which then has to go through the OCR process in order to create text. If your source document already has text, such as a typical web page or Word file, this is generally not the right technique for creating a PDF, that is, there's no reason to go from text to an image and then back to text again via OCR. 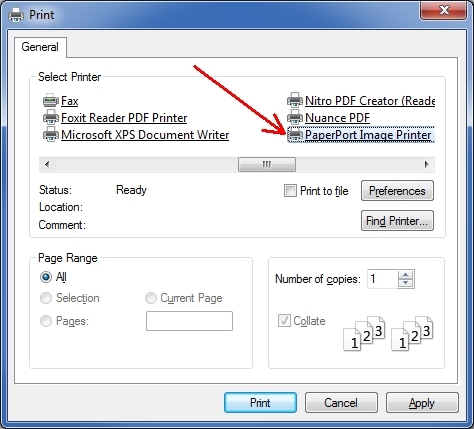 The better technique is to print to a PDF print driver that goes from the source text straight to text in the PDF file, creating what's known as a PDF Normal file. PaperPort installs such a driver that has had various names over the years, including DocuCom, Nuance PDF, and ScanSoft PDF Create. These are in addition to, and different from, the PP Image Printer. They are similar to other PDF print drivers that create a PDF Normal file (straight text-to-text, i.e., no OCR), such as Adobe PDF (Distiller), part of an Adobe Acrobat installation, as well as many free ones, including Bullzip, CutePDF Writer, doPDF, Foxit Reader PDF Printer (part of the Foxit Reader install), Nitro PDF Creator (part of the Nitro Reader install), PDFCreator, PDF-XChange Printer (part of the PDF-XChange Editor install), and PrimoPDF. 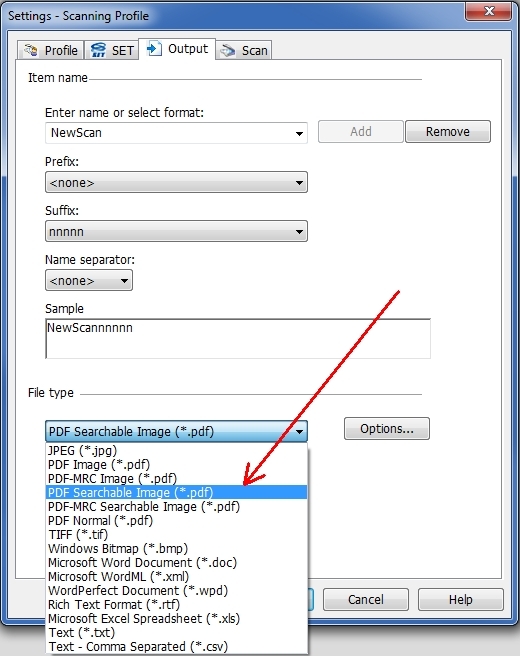 In summary, when scanning paper, you must scan to an image and have PaperPort invoke OCR to create a PDF Searchable Image file (which it does automatically via a Scanning Profile). 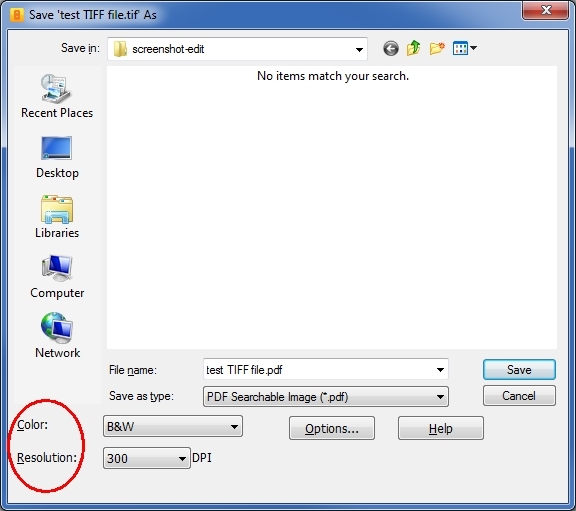 Likewise, when converting an image-only file, such as a BMP, JPG, PNG, [image-only] PDF, or TIFF, to a PDF Searchable Image file, you must also have PaperPort invoke OCR to create it (which it does automatically via Save As). 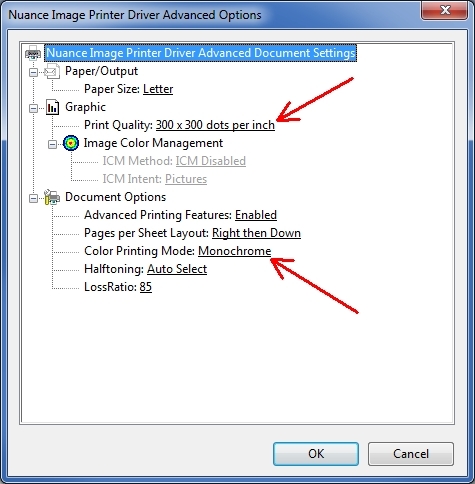 But when printing to a PDF file, you should print to the PP Image Printer only if the source document is a raster image (bitmap/graphic); if it isn't, then it's better to print to one of the other PDF print drivers mentioned above. Two important variables that affect OCR accuracy are Mode (Black&White, Grayscale, Color) and Resolution (DPI - dots per inch). For typical business documents, I recommend B&W (monochrome/1-bit) and 300 DPI. This generally results in reasonable files size and accurate OCR. On rare occasions, I'll use B&W and 400 or 600 DPI, but in many cases, 600 DPI (counter intuitively) results in less accurate OCR. On other rare occasions, I'll use Grayscale (8-bit) and either 200 or 300 DPI, which sometimes results in more accurate OCR. 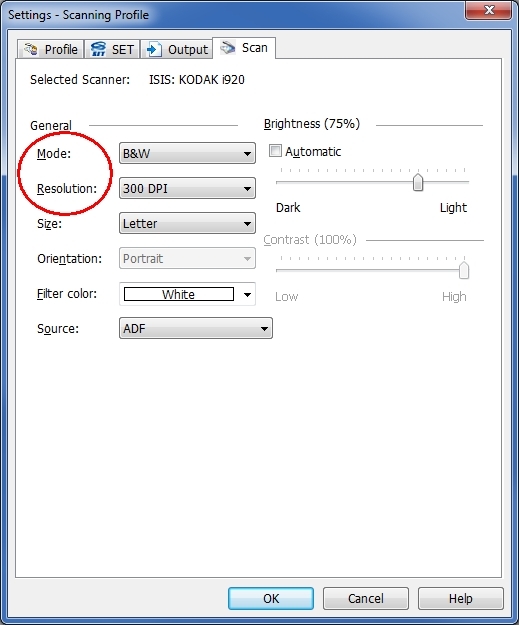 To learn more about Mode and Resolution when scanning, I recommend Wayne Fulton's excellent site, A few scanning tips. In particular, look at the section that discusses OCR, Scanning Line art. That's it! 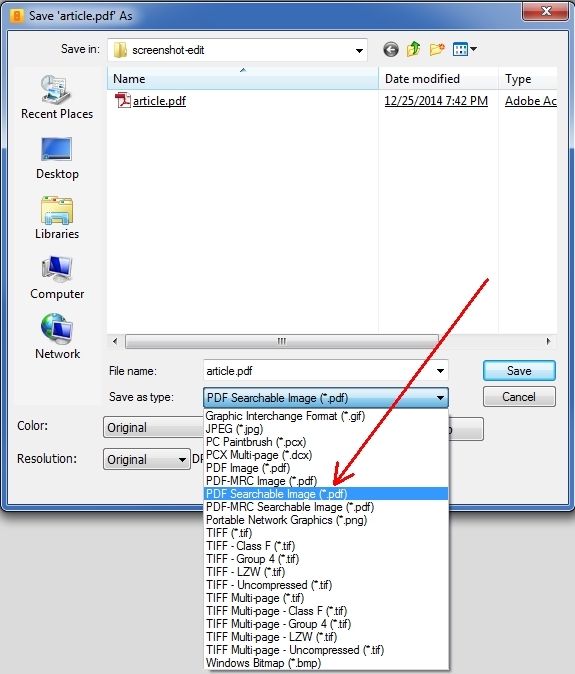 Three easy ways to create PDF Searchable Image files in PaperPort 12 and PaperPort 14.